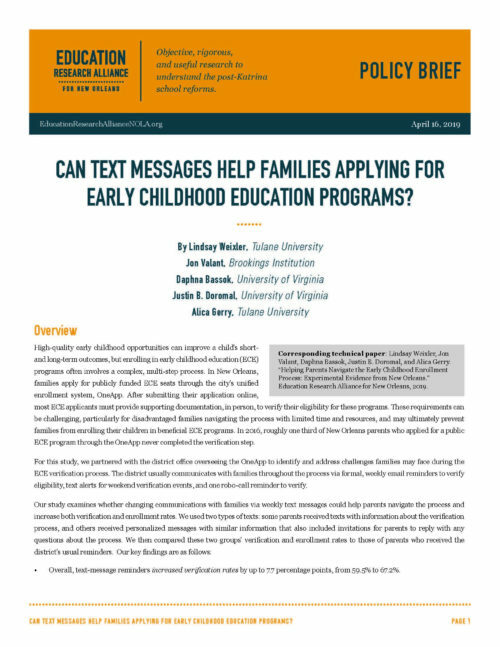 A new study by Lindsay Weixler, Jon Valant, Daphna Bassok, Justin B. Doromal, and Alica Gerry examines whether changing communications with families via text messages could help parents navigate the school choice process. High-quality early childhood opportunities can improve a child’s short- and long-term outcomes, but enrolling in early childhood education (ECE) programs often involves a complex, multi-step process. In New Orleans, families apply for publicly funded ECE seats through the city’s unified enrollment system, OneApp. After submitting their application online, most ECE applicants must provide supporting documentation, in person, to verify their eligibility for these programs. These requirements can be challenging, particularly for disadvantaged families navigating the process with limited time and resources, and may ultimately prevent families from enrolling their children in beneficial ECE programs. In 2016, roughly one third of New Orleans parents who applied for a public ECE program through the OneApp never completed the verification step. For this study, we partnered with the district office overseeing the OneApp to identify and address challenges families may face during the ECE verification process. The district usually communicates with families throughout the process via formal, weekly email reminders to verify eligibility, text alerts for weekend verification events, and one robo-call reminder to verify. Overall, text-message reminders increased verification rates by up to 7.7 percentage points, from 59.5% to 67.2%. The text message reminders were particularly effective for parents who applied solely to public pre-K programs. For this group, verification rates increased by up to 14.5 percentage points, from 67.9% to 82.4%. Effects for Head Start applicants were smaller and not statistically significant. Personalized text-message reminders also increased enrollment for pre-K applicants by 10.1 percentage points, from 62% to 72.1%, while non-personalized reminders had no significant effect. Almost 90% of families receiving personalized text messages engaged with district staff, providing a real-time glimpse of the specific challenges preventing many parents from completing verification. Half of these parents asked questions related to understanding the process, and one in five mentioned a logistical barrier limiting their ability to complete verification. This is the first study, to our knowledge, to examine how text-message support affects ECE verification and enrollment rates in a centralized enrollment system. Our study provides initial evidence that supporting families through the application process with a low-cost text-message system has potentially high payoffs, improving verification and enrollment rates and enabling parents to access high-quality early childhood education for their children.